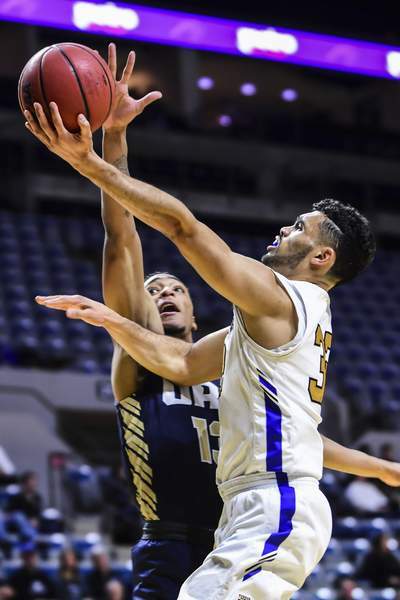 Purdue Fort Wayne scored on six consecutive possessions during a 13-0 run to go up by 18 points with under two minutes to play in the first half en route to a 94-69 victory over Oral Roberts Thursday at Memorial Coliseum. The Mastodons (12-7, 4-0 Summit League) handled the Golden Eagles' zone – a defense that PFW hasn't faced much this year – to cruise to it's sixth consecutive win and hold sole possession of the Summit League. Matt Holba had eight of the team's first 10 points on back-to-back 3s and a pair of free throws all before the first media timeout. Coach Jon Coffman received significant minutes and production off the bench from Cam Benford. Benford scored on an and-1 to make it 24-18 halfway through the first half. The Mastodons offense was jump-started by an aggressive defense. They turned 18 Oral Roberts (7-12, 3-1 SL) turnovers into 24 points. A Marcus DeBerry steal off of a collision led to a four-on-five advantage for the Mastodons. Kason Harrell missed the layup but John Konchar followed it up with a vicious slam putback to start the 13-0 run. Oral Roberts' Emmanuel Nzekwesi had 18 points and 11 rebounds at the half, but the Mastodons shut him down for only two points in the second half. The Mastodons hit their first 5 of 7 from the 3-point line to start the second half hot. They hit 15 of 30 in the game. Coffman's team was eating apart this Oral Roberts zone. The inside out game PFW executes so crisply produced 22 assist on 34 made baskets. Five Mastodons scored in double figures with Harrell leading with 22 points and Konchar with 21. The last time the Mastodons started 4-0 in league play was the 2010-11 season, when they started 5-0.